India Women's team completes double over Indonesia with a 2-0 win! 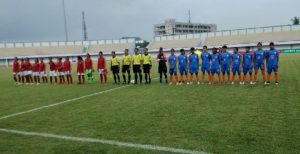 Home / International Football / Asia / India Women’s team completes double over Indonesia with a 2-0 win! India Women’s team completes double over Indonesia with a 2-0 win! Two goals, one in each half, gave the Indian Women’s National Team a 2-0 victory against hosts Indonesia in Jakarta on Wednesday, January 30. While Sanju scored in the first half, Dangmei Grace netted the second just minutes ahead of the full-time whistle. This was India’s second successive victory against Indonesia, the previous match ending 3-0 in favour of the away side on Sunday. Previous VIDEO – Mumbai City FC: Islander Teammates ft. Souvik Chakrabarti! Next Spanish defender Inigo Calderon leaves Chennaiyin FC mid-season!